This interesting species of moths gets its name form the Greek mythology… namely Atlas The Titan, there’s no question as to why that is so. You might be wondering weather or not this giant moth is useful for something, well, you should know that in India, Atlas moths are grown for the silk their larvae produce. As opposed to the silk produced by the related Silkworm moth (Bombyx mori), Atlas moth silk is a brown, wool-like silk, secreted as broken strands, not full liniar silk. Have a look below and observe just how amazing this creature is… it’s huge and yet so beautiful. But who are the runner-ups as far as the the title for largest moth in the world is concerned. Well have a look below and see for yourself. 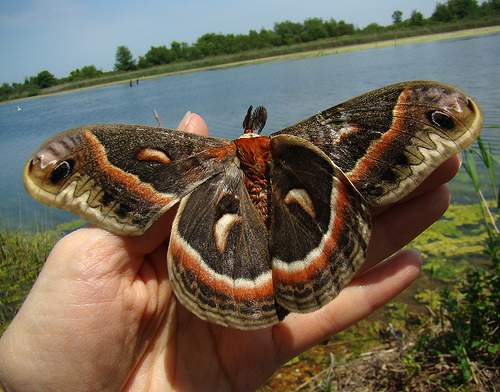 The Cecropia Moth is the largest moth in North America with a wingspan of 160 mm or more. The saturniids are one of the largest species of moths in the world with an amazing wingspan of 15 centimeters. The even more interesting part about his is the fact that they form a family of Lepidoptera, which have an estimated 2,300 described species throughout the world. This huge inset is about the size of your palm, meaning its wings have a span of 14 centimeters. 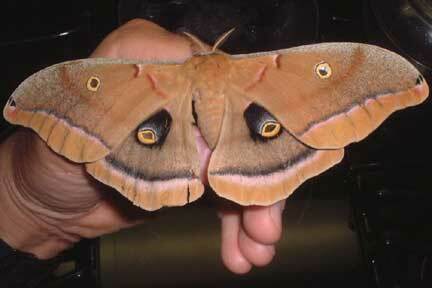 This is another member of the Saturniidae family and it’s a giant silk moth. It gets its name from its spots, which resemble the cyclops, hence it was named after the Greek myth of the Cyclops Polyphemus.